Craig Thomson and Ross Davidson battle during the weekend's game. Pic by Kenny Mackay. Darren Young wants his East Fife side to go into each of the remaining six league games with the intensity of a cup final. Results over the past few weeks haven’t been what the side wanted as they aim to close out a place inside the top four. On Saturday they were beaten 2-0 by second bottom Brechin City. It means those tucked in behind the Fifers can still see a chink of light as they aim to topple the Methil men in the coming weeks. Montrose are just six points behind East Fife and have played a game less with Airdrie just a further point behind them. Despite that, both would swap places with the Fifers in a heartbeat with the Methil side still having things in their own hands. And boss Young wants to see his side refocus ahead of the last few games, starting this weekend at Bayview against Raith Rovers. He said: “There’s no panic. “We have six cup finals left to play to get us into a play-off we’ve never been in before. “There will be plenty of twists and turns still to come . “But it’s up to us to go out in the games we have left, take our chances when they come and be hard to beat. It’s Fife derby day again this Saturday when Raith arrive at Bayview. With both jostling for their place inside the top four, there’s still plenty at stake when the two meet. Young added: “They’ll be out to prove a point. East Fife have taken seven points from a potential nine against Raith Rovers this season, and Young knows his side must be at the same high standards for any repeat this weekend. 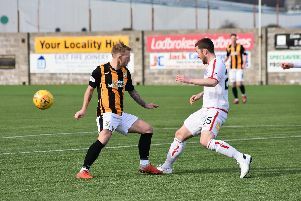 A win for the Fifers will go a long way to securing their place inside the top four and take them to within four points of their Kingdom rivals. East Fife have beaten Raith home and away this campaign having drawn the first game at Stark’s Park. While Raith haven’t had the year many would have expected of the only full-time squad in the division, they’ll still prove a massive test for the Fifers. Young is calling on his side to show the same attitude they did in the other league fixtures. He said: “We will go into the game with the same mentality as the previous three games. Fife fans were left disappointed at the weekend when they failed to beat Brechin at Bayview. Barry Smith’s men scored either side of the break to ensure the win. Young felt his side had deserved something from the game, but admitted he may freshen things up ahead of the Raith visit. He added: “We’ll probably look at making one or two changes. “Brechin have an experienced side with the likes of Dougie Hill and Tam Scobbie and Lewis Toshney on loan from Dundee United. “But we still feel we should have taken something from the game. “Their two goals come from two mistakes and we’ve had about eight shots on target and haven’t scored. “They’ve had two and scored two. Young has already started building for the new season, with the club this week announcing the re-signing of several first team players. Liam Watt, Aaron Dunsmore and club captain Kevin Smith have penned new deals.